We have a full complement of modern equipment. Like many other industries we have greatly benefited from the computer revolution. Our machinery is now computer-controlled under the guidance of expert craftsmen. CNC (Computer Numerically Controlled) machinery allows for exquisite design — compound curves, drop-through, routed elements and bas-relief. Your design is executed either in-house or taken from your architect’s CAD software files (CAD is an abbreviation of Computer Assisted Design, a method common to architects, interior designers and contractors). CAD+CNC allows for tolerances as tight as .01″ and has opened up a whole new world of curves and depth — cuts which were technically impossible to execute by hand. As you might imagine, the use of the computer increases accuracy (no more redrawing of designs) and reduces time — the mill or saw follows the data stream from the computer, tirelessly cutting. For the architects this means their files are uploaded without reinventing the wheel. For the contractor or interior designer this means the design is output to spec — it fits in the space, it looks the way the client envisioned it, and it matches the end-customer’s expectations. Bonus: time and money are saved. 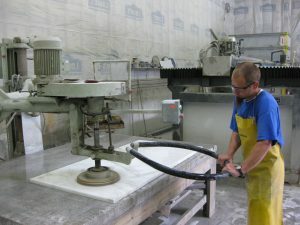 Our state-of-the art machinery includes two saws, our CNC milling machine, our blacksplash finisher, and our repolisher. The dual saws allow us to work on more than one project at a time, opening up our workflow to accommodate a complex project without halting the flow of simpler projects. The backsplash finisher is dedicated to polishing exposed short edges on narrow strips of stone. These strips are frequently used behind sinks to keep water off the wall. The CNC mill allows us to make beautiful compound curves, cut holes for sinks, faucets, and showerheads, and perform in-cuts such as drain board grooves or decorative bas-relief elements. Finally, we use the repolisher to take off scratches and wear from damaged surfaces such as customer-owned furniture — think antique sideboards with marble tops, stone wainscoting and older countertops in historical structures.